A Pennsylvania police chief, who angered some of his department’s rank-and-file members by speaking out in uniform at the Democratic National Convention in support of criminal justice reforms, announced his resignation. Pittsburgh Police Chief Cameron McLay (above) said he would step down just weeks after the union representing his department’s active and retired officers held a vote of “no confidence” in him. Mayor Bill Peduto appointed McLay in September 2014 to head the Pittsburgh police force and work on improving relations between the department and the city’s many minority residents. According to Reuters news report by Laila Kearney, in speech at the Democratic National Convention in Philadelphia in late July, Chief McLay called for reforms of the criminal justice system to bring about greater fairness in policing across the country. Pittsburgh is one of many big U.S. cities, including New York and Chicago, that have instituted law enforcement reforms in recent years after a series of high-profile police killings of black men, many of whom were unarmed. 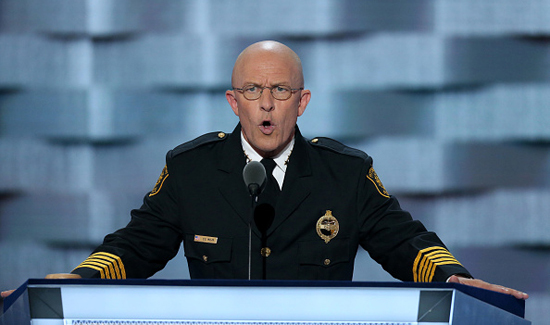 The speech riled some of his department’s officers and prompted the Pittsburgh Citizen Police Review Board to release a special report that concluded that McLay had acted improperly, especially by appearing at the convention in uniform.